prepare crepes as per recipe directions and set aside for later use (starting with 3 eggs per 1/2 quart [liter] of sauerkraut). Wash sauerkraut (if appropriate), drain well and grate in one carrot (if your sauerkraut does not have carrot in it). Grate mushrooms into a frying pan and fry mushrooms in a little oil only until they soften. Combine mushrooms into sauerkraut, add salt and pepper and mixing well. Taste filling and adjust salt and pepper to taste. 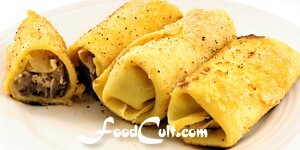 Roll sauerkraut-mushroom mixture into a crepe as shown. Bathe finsihed roll in beaten egg. Roll egg-bathed roll in breadcrumbs and set aside. When frying, fry at moderatly low heat to allow filling to heat before bread crumbs burn. Notes: Polish croquettes should be frozen unfried if reserving them for later use. To use frozen croquettes, let them defrost fully before frying. We like to fry these in a little oil since butter burns too quickly - not allowing the filling to heat properly. Why do we call it a "Polish Croquette"? Well, one would think a croquette is a croquette is a croquette ... but, in fact, they are not all the same. The Polish croquette (also written as "krokiety" and "krokiet") is distinct. It uses a crepe (or "French pancake") for the form. Where most croquettes are, in fact, some form of potato and shaped like a cylinder, in the Polish permutation of the croquette, the filling (meat, cabbage, mushrooms and/or sauerkraut) are wrapped in a crepe, breaded and then pan fried. Croquettes may even be spelled differently from one culture to another. This particular variant is a delightful vegetarian (but not vegan) snack - generally served with a cup of hot borscht. We reduced the oil used in this recipe ... and the salt a little too. This is a real slice of Polish gastronomic life!